Indian meal moths are most distinguishable by their unique looking wings. The front half of the wing is a yellow-gray, and the back half of the wing is bronze, copper, or dark gray with a dark band separating the two halves. Adults can grow to between 1/2 and 5/8th of an inch in length. Their larvae, which are actually responsible for most damage to food packages, are about 1/2 of an inch long. Depending on their diet, the body can be off-white, brown, green, or pink. Their head and thorax are yellow-brown. Where are Indian meal moths found? 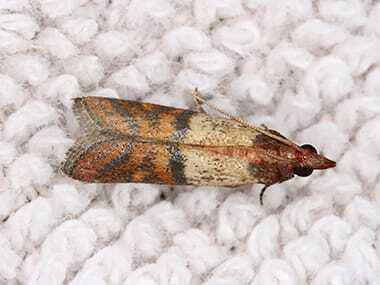 Indian meal moths are a type of stored product pest. Adults cause no real damage or harm, but they do lay their eggs in food sources that then become contaminated with the eggs and the developing larvae as they feed on that food source. Indian meal moths are commonly found living in food processing and storage facilities; they can also be problematic in homes when they are accidentally introduced through infested products that are purchased at stores and are brought into the home. Adults are attracted to light and may enter a home through gaps found around windows and doors while foraging for food. What do Indian meal moths eat? Indian meal moths infest a variety of dry stored food products including: dried fruits, grains, seeds, granola, graham crackers, nuts, chocolate, candies, bird seed, dog food, powdered milk, dried red peppers, and chocolate. To prevent an Indian meal moth infestation in your home’s kitchen or pantry you should always check any dry goods that you are purchasing for holes or rips in the packaging. When you get items home from the store it is a good idea to remove them from their original packaging and place into plastic or glass containers. Routinely clean out the pantry to get rid of expired items and to clean up crumbs and spills. To prevent adult moths from entering your home, caulk gaps around windows and doors and change white outdoor lights to yellow or sodium vapor lights, which are less attractive to insects. For relief from Indian meal moths and other pantry pests, contact Quik-Kill Pest Eliminators. We’d be happy to discuss your situation and pest control treatment options. Schedule Your Free No Obligation Inspection Today & See How Quik-Kill Can Keep Your Home Pest Free. Guaranteed.